June's third giveaway is going on now through tonight! One lucky winner will be sent a 4 ounce Burt's Bees All-in-One Body Wash. This "Outdoor" wash is naturally scented with peppermint, spearmint, rosemary, and lime essential oils and can be used from head to toe. 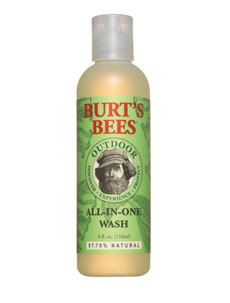 It earns a five star rating by customers on the Burt's Bees website! Contest ends Friday, June 25th at 9pm EDT. Winner will be drawn June 25 at 9pm. Congrats to Geo G., winner of the NVEY ECO eyeshadow!